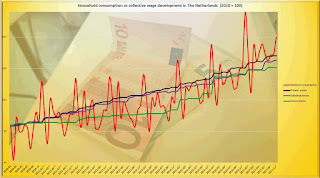 It is one of the recurring themes of this blog: the subdued wage development in The Netherlands and the effects that it has on domestic consumption. It is no secret that the lower and middle classes hardly had any wage increases during the last ten year. It is also no secret that many of the store chains aimed at the middle classes in The Netherlands are going through a hard time and that the most successful store chains are either situated at the bottom or the top of the market. This is the effect of the lackluster consumption in The Netherlands. What most people already suspect has now been proven by two investigators of the Dutch National Bank (DNB). In an article in Het Financieele Dagblad, Johan Verbruggen and Peter Keus stated that there is a strong correlation between the subdued wage development and the hampering Dutch consumption. More important, however, is that they also proved that the influence of flexible labour on this subdued wage development is considerable. The pressure of the flexible labour force and also the influx of foreign workers on the wages and rates of normal, contracted workers makes that their wages hardly rose during the last ten years. This is the reason that The Netherlands falls behind in economic development, in spite of impressive export figures. The large number of flexible labour contracts in The Netherlands pushes the wages down and hampers the consumptive spendings and prosperity in The Netherlands. This conclusion can be drawn from a blog of two researchers of the Dutch National Bank on the website of economic magazine ESB. Johan Verbruggen and Peter Keus investigated how the Dutch economy performed during the period of 2002 to 2017, in comparison with seven other Western economies: Germany, Denmark, the UK, the US, France, Canada and Finland. The Netherlands is a moderate performer, according to Verbruggen and Keus. In order to explain the disappointing growth results, both researchers looked at the composition of the growth. There The Netherlands displays a blatantly different pattern than the other countries. In the period under research the Dutch entrepreneurs were successful in the export of goods and services to foreign markets. Only Germany did better and the US did about as good as The Netherlands. That The Netherlands is nevertheless only moderate in growth and not belongs to the leading countries in this respect is caused by the strongly subdued private consumption. This consumption per capita in fact stagnated since 2002, while the other countries experienced a growth ranging from 10% to 25%. One of the explanations for this phenomenon lies in the share of the national income that flows to the wages. This so-called labour income quote (i.e. AIQ in Dutch) is under firm pressure in the whole industrialized world. Much of the growth is transfered to the suppliers of capital, in the form of interest and profit, and so only a lesser part is transfered to the workers as wages. This labour share within the Gross Domestic Product has stabilized at best in the countries under investigation. In especially the US and The Netherlands the share of labour in the GDP dropped considerably. In The Netherlands, the emergence of flexible labour is one of the causes. Verbruggen en Keus write: “The excessive flexibilization of the labour market in The Netherlands puts downward pressure on the labour income quote”. More flex labour made it possible for employers to pay lower wages to their workforce. This came at the expense of consumption and hence of economic growth and prosperity in The Netherlands. There you have it. Wage restraint, under pressure of a flexibilized labour force, as well as the influx of workers from the low wage countries (i.e. India and Eastern Europe), has had a direct influence on consumption and prosperity in The Netherlands. For the regular readers of this blog, this conclusion can hardly come as a surprise. The problem of wage restraint is that it is a fyke, as a matter of fact: once companies start with it on a broad (i.e. national) scale, it will inevitably have a substantial influence on the wage development and consumption in a country. As a consequence of this, it is almost impossible to stop with wage restraint. and finally, lower profits and earnings among SME companies lead to the need to continue wage restraint in order to not land into the red figures. It is the perfect fyke! In fact, the only ones who can change it are the large (multinational) companies, the government and the large capital suppliers, by simply raising the wages whenever they have the possibility to do so. Unfortunately, in The Netherlands the government did in fact the contrary. They did so by hardly raising wages for their fixed workers, by making much more usage of flexible labour within their labour force and finally, by substantially raising all kinds of taxes and levies, thus making life more expensive for the Dutch lower and middle classes. One could therefore justifiably state that the government is directly responsible for the subdued consumption in The Netherlands. I made a chart, based upon the correlation between the consumption in The Netherlands and the collective wage development among private companies, subsidized institutions and the government. This correlation is already stunning, even when the chart is also including consumption of food and necessary supplies, that are less prone to positive or negative change (i.e. people still have to eat and buy for instance toilet paper). If these necessary articles would have been left out of the equasion, the image would be even more conspicuous when it comes to the stagnation of private consumption. In the chart I “dramatized” the indexed changes by setting the Y-axis values between 94 and 120 (i.e. 2010: 100). However, the change of the income for all three groups (government, subsidized institutions and private companies) never exceeded 11% growth since 2010. And this wage increase is excluding inflation, which has eaten a considerable chunk from this 11% wage increase! Looking at this particular image, t isn’t so strange that the development of private consumption in The Netherlands is so lackluster and that normal store chains for the lower middle classes are doing so poorly in general. The big picture of all this is that especially capital investors and executive remuneration have profited excessively from the economic growth and the successful export of the last eight years, while the common workers footed the bill for it, by keeping the Dutch export prices lower than they should be in reality. This is wonderful for export, but killing for domestic consumption. In spite of numerous statements by Dutch National Bank representatives (even chairman Klaas Knot made such a plea) and various professors in Economy to end this utterly damaging practice of wage restraint, the Dutch government and large employers have turned a blind eye towards the serious drawbacks of it. The government and the large employers are not willing to raise the wage by 5% per year for the next few years, while the small and medium enterprises cannot raise the wages of their personnel, as their budget does not allow them. And so the lackluster domestic consumption will remain lackluster in the following years to come. And that’s a shame!